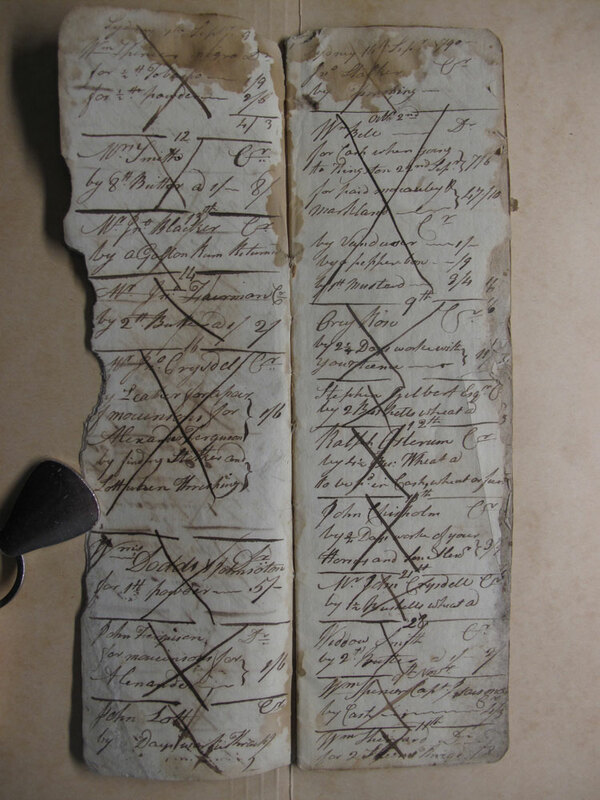 It is amazing that an account book, dated 1790-1796, of a merchant living in Sidney and then Thurlow Township, has survived. The merchant is not identified. Given the evidence below, I have concluded that the account book belonged to Capt. John W. Meyers. It has been quite a thrill to make this discovery and I hope the conclusion will stand up to further scrutiny. Pages 6 & 7 of the 1790 Sidney account book. Why I have concluded that the account book is the work of John W. Meyers. John Meyers first settled in Sidney Township and then later moved to Thurlow. 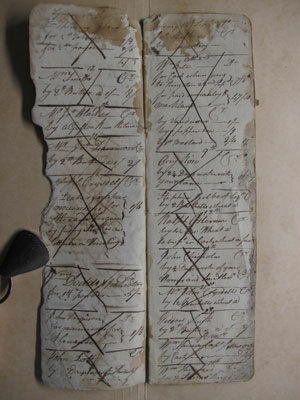 The author of the account book states his location as Sidney from July 1790 to Feb 1792 and then there is a lapse in use. It is used again in Nov 1795 till Jan 1796 and the location changes to Thurlow. This move from Sidney to Thurlow matches what is known about Capt. Meyers. See the overview on the web page about Capt Meyers for a discussion of when he moved to Thurlow and how it matches very well with the account book. John Bleecker was a trader in the area at the time but he is entered as a customer [Blacker] on page 6 in the account book so he is not the author. Dr Canniff was fascinated with Meyers and given his hard work in interviewing oldtimers in 1864, it is not surprising that he came to possess this document. Most importantly, the handwriting analysis below strongly suggests that Capt John W. Meyers is the merchant who kept this account book. This is the main support for my conclusion. I am not a handwriting expert - far from it. Most of the petitions of John W. Meyers appear to be written by a clerk or Justice of the Peace. However in many cases a consistent signature of John W. Meyers is present on these petitions. This was normal practice at the time. Settlers wishing to make a petition would pay a clerk familiar with the expected wording to write the petition and then sign it if they were able. Go here to see transcriptions of petitions of Capt John W. Meyers. Peter Johnson, well known loyalist expert, suggested to me that a single page in a 1796 petition was probably written by the hand of John W. Meyers. This page is an affidavit asking that his relations be "confirmed in their certificates for 200 acres each." The signature on that page matches the style of writing on the page and also matches other signatures of John W Meyers on some of his other petitions. This petition is UCLP, RG1 L3, LAC, 1795-6, V328, M 2 / 128, C-2191, and the page in question can be seen on line at image 676. Various words from the petition have been extracted and placed in the left column of the table below. A second petition in the same handwriting was found after the above analysis. This petition uses the T style found in the above petition that was used in the comaprison. UCLP, RG1 L3, LAC, 1795-6, V328, M 2 / 67, C-2191, starts at image 498. A third item surfaced later, a letter included in a petition bundle, is also in the hand of John W Meyers. Note that on the 4th line, the words "Township of Thurlow" use the T style found in the account book. See the last example in the chart below. UCLP, RG1 L3, LAC on line, 1792, V377, M2 Misc 1788-1798 / 202a, C-2192, starts at image 312. A fourth petition is also in his hand. This petition is written in his best hand and note there are two capital T's showing both variations seen in these petitions and the account book. The signature is unusual and very stylized. UCLP, RG1 L3, LAC on line, 1797, V329, M3/80, C-2192, starts at image 436. The 30 page account book is in a folder in the William Canniff Papers at the Archives of Ontario. The account book has not been microfilmed. I have photographed the pages and my transcription is on this web page. For copyright reasons these images cannot be reproduced here although one page is shown above as an example. Selected words have been extracted from the account book and are placed in the middle column below. The capital T is the one letter that that did not compare well between the one page carefully analyzed and the account book. However the later pages that surfaced have shown that Meyers used both variations of the capital T. The T is not a problem. I would be delighted to share the images with a trained handwriting expert. Having seen the whole account book, it is easy to conclude that the penmanship of the four above petitions and the 1790 account book are by the same person - Capt John W. Meyers. At this point, you are free to judge and send me your comments. The account book gives a wonderful insight into the goods that a merchant successfully sold or traded. There is a lot of similarity in how John is written. The sweeping W is seen all through the account book. The capital G has some variation but is similar to the Graves. More g, p and d's. The lower case d has the reverse sweep. The lower case p is consistent throughout the account book. Upper Canada and uppers for shoes - the same. The capital B and R have the rising line on the left. The capital R in the petition appears a little different. The word half looks the same. The capital D has the same structure. Note the sweeping W again. The capital T in the petition is repeated a few times and is not seen in this style in the account book. It is one oddity that casts doubt. Note the small case th is the same. However in 2 petitions that were found after this analysis, Meyers uses both styles of the T in petitions. From the 1792 petition mentioned above. See Image 312. Here the capital T's in the account book look the same as in the 1792 petition of John Meyers.